ITunes Current Song Menu allows you to display the song currently played by iTunes (and other information) in the menu bar and to search for its lyrics. 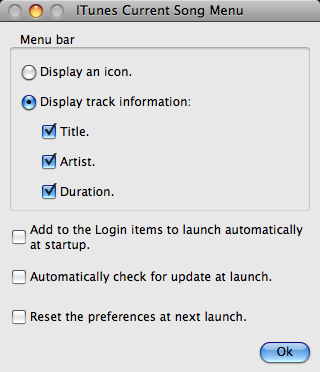 You want to display the song currently played by iTunes in the menu bar? You want to open, play, pause and quit iTunes from the menu bar? You even want to search for the lyrics of the song currently played? Then ITunes Current Song Menu is what you need! - It displays an icon or the song currently played by iTunes in the right side of the menu bar. - You can open iTunes, start playing, play previous track, play next track, stop playing and quit iTunes from the menu bar. - You can automatically search on the internet for the lyrics (or a list of lyrics) of the song currently played from the menu bar. - It is available in Danish, Dutch, English, French, German, Italian, Latvian, Polish, Spanish and many other languages. Under Mac OS 10.13 High Sierra, if you're launching the Application for the first time, Mac OS' GateKeeper (which you can configure in the "System Preferences") will refuse to launch it because you've not downloaded it from the Mac App Store (but from our website). In this case, instead of double-clicking on it, all you have to do is to right-click on the Application's icon, and then select the "Open" menu. A message will appear in which you'll be able to confirm that you want to launch the Application (even if it was not downloaded from the Mac App Store from an Identified Developper).